The Garden Plot: Christmas time to make others happy! Christmas time to make others happy! A friend of mine, Janet Strauss, taught me a wonderful prayer, mantra, meditation, affirmation, whatever you want to call it. "The time to be happy is now. The place to be happy is here. The way to be happy is to make other people happy." That could not have been more true when we at the Garden Media Group adopted two families - five children - for Christmas. We found our angels through the Episcopal Church of the Advent in Kennett Square. A Christmas outreach program benefits children at La Communicad Hispana. La Communidad helps immigrant and low- income residents of Southern Chester County stay healthy, build strong families and lead productive and fulfilling lives. 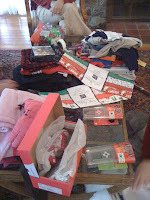 Tracey did all the shopping for the office - MP3 players, pink shoes, iTunes gift cards and more. She knows how to shop!!! Then we all selected a little angel and helped make their Christmas dreams come true. We wrapped everything. Gloves in one box. Hat in another. We were definitely, as our friend Lloyd Traven says, "Seven women wrapping!" Merry Christmas and Cheers to 2011 . . . !! !